Like any fashion, make-up went through highs and lows of popularity through the centuries, indeed, from decade to decade. This article will concentrate on Britain in the 1800s, up to and including the early Victorian era. It by no means applies to other parts of the globe, and does not cover all the different tastes and divisions of style that existed. Remember, there are always exceptions in every circumstance. A point of clarification; make-up was not a term used commonly until after 1870. * Cosmetics referred to anything applied to the skin of a medicinal nature, and embellishments were pastes, powders and paints, used to alter appearance. People with acne or smallpox scars, or similar disfigurements, often wore pastes to smooth their complexions. All of these products were purchased at local apothecary (pharmacist) shops and through doctors or, for the very wealthy, ordered from specialist dealers abroad. There were also home-made versions, and even the poor where known to indulge. So, yes, people did wear make-up throughout the 19th century, subtly and garishly. Here we have a macaroni (circa 1780) and dandy (1818) at their “toilet tables” getting ready for their day. Note the posture and waistline of the dandy indicates a corset. On the right is a drawing of George “Beau” Brummell. 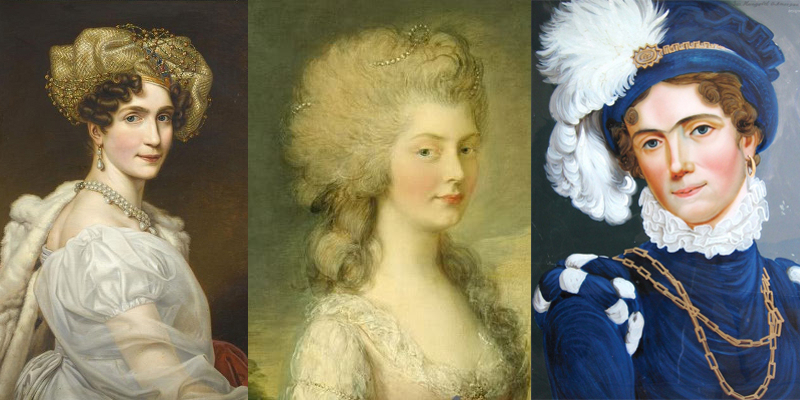 Ladies from late 1790s to 1830, revealing the popularity of very pale complexions with rosy cheeks, somewhat red lips, and perhaps a bit of eye-liner. 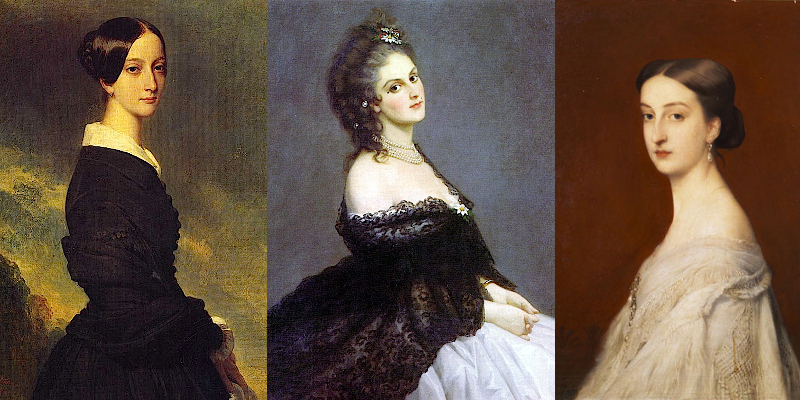 The most ostentatious adornment in these portraits is a pearl necklace. Ladies had already gone to limited use of make-up during or soon after the French Revolution (1789 to 1799), rouge being the exception. Clergymen preached against “painted ladies” pointing to Jezabel and godless heathens around the world as examples of ill repute. The Church of England, along with Britain’s empire building, was determined to bring purity and modesty to women of all lands. Queen Victoria denounced painted faces as vulgar, but it was later in the era with her prolonged mourning period, and not until the 1870s with an economic depression that minimalism became the strictest, only to swing back again in the 1880s with the “professional beauties” and completely abandoned in the “Naughty Ninties.” (For more on these societal changes and the Victorian feminine ideal, click here.) In the 1840s, only prostitutes and actresses, who many considered of the same ilk, embellished their appearance with excessive paint and gaudy jewellery; however, limited use was the rule for most ladies. By about 1850, as only the most effeminate of dandies were still applying make-up, women were adopting subtle applications, and wearing more precious adornments. It was during this decade Crème Céleste became popular, which was a mixture of white wax, spermaceti (from an organ inside sperm whale’s head), sweet almond oil, and rosewater. This facial paste had moisturising properties, but it also hid blemishes and provided a light smooth complexion. It developed into a common emollient and cosmetic remover, soon known as cold cream. Portraits from the 1840s to 1860s. Two lovely “toilet table” chests from the 1850s, of rare wood and bound with brass, lined with lush velvet, both would likely have mirrors in the lids and amongst the various containers include scissors, tweezers, medicine spoons, corkscrews, bodkins, boot hooks, knives, &c.
How did ladies of the nobility and gentry hide their use of pastes, paints, and powders? By including the products in their toilet chests, designed for use on their dressing tables and for travel. Within these expensive little boxes were medicinal cosmetics, and all the application tools, but then the vilified embellishments as well. Some chests were crafted with secret compartments. An imported box of make-up could easily be emptied and discarded, the products re-bottled and placed amongst acceptable skin creams and treatments, many provided by doctors and therefore totally respectable. In particular, prescriptions were an ideal excuse for older ladies to coat their faces with a paste, achieving a light-coloured even coverage, and the charming bloom of youth. 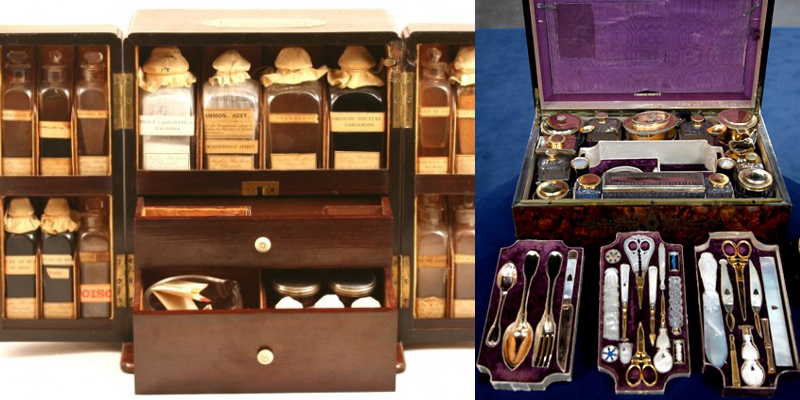 Middle-class women often couldn’t afford their own toilet chest, but they could purchase a medicine chest for a reasonable price, and hide appearance enhancers in with the tonics and balms. The products were all readily available at any apothecary shop, and a discreet lady could send a servant to the next town for purchases that might prove embarrassing. Two ends of the spectrum. 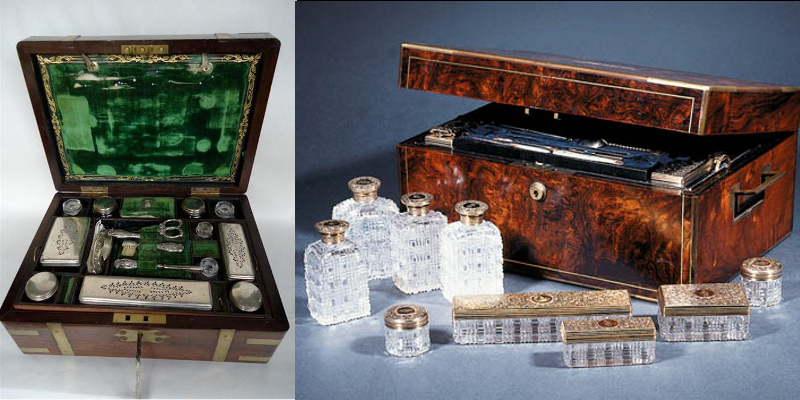 A plain apothecary’s chest from London, Taylor Bros of Cavendish Square, 1860, but with a secret compartment, and an elegant travel case including a hidden document wallet, gold plated cutlery, mother-of-pearl handles, sewing kit, pens and inkwell, numerous spare cut-glass containers, &c. Both would have served well to hide a lady’s make-up. If you would like to peruse hundreds of portraits of wealthy ladies from 1480 up to 1914 please visit the Grand Ladies website. “Lizzie, since the reader first knew her, had begun to use a little colouring in the arrangement of her face… there was the faintest possible tinge of pink colour shinning through the translucent pearl powder. Anyone who knew Lizzie would be sure that when she did paint she would paint well.” The Eustace Diamonds by Anthony Trollope, first published in 1871 as a serial in the Fortnightly Review. “Half the girls do it, either paint or powder, darken their lashes with burnt hair-pins, and take cologne on lumps of sugar or belladona to make their eyes bright. Clara tried arsenic for her complexion, but her mother stopped it,” said Fanny. 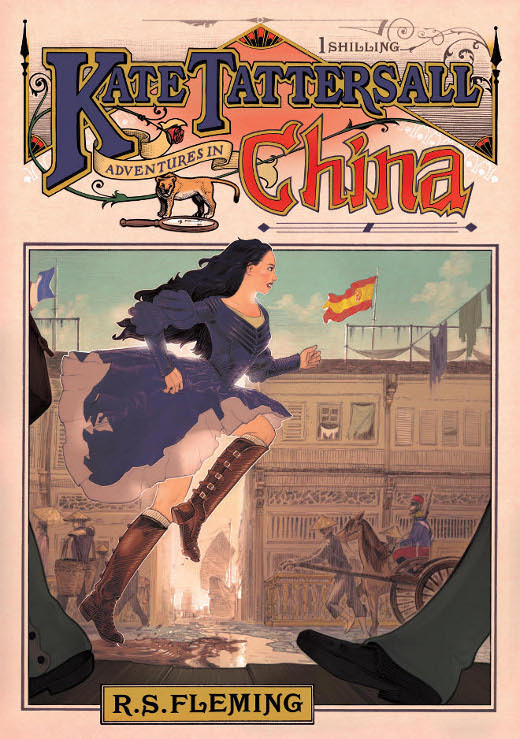 An Old Fashioned Girl by Louisa M. Alcott, first serialised in the Merry’s Museum magazine in 1869. Trivia: By the late 1800s women were using blue pencils to trace their veins. Powders were available with blue and lavender tints. This allowed women to appear very pale even in the yellow aura of gas and candle light. *The earliest quote I could find where the term “make-up” is used to denote an application to the face, appears in “The Pearl of the Antilles, or, An Artist in Cuba” by Walter Goodman, 1873. In it he uses make-up to describe the various ways he alters his appearance for the stage. Other quotes I’ve found from that decade are likewise always in reference to the theatre. I have read many articles on the history of makeup, however this post is best for the 1800s, keep it up. All these articles are very informative. Would women have committed suicide by drinking their belladonna? @ Amori, people were prescribed belladonna in small amounts as medicine, sometimes mixed with opium. I couldn’t find a clear record but it’s probably safe to surmise many died of overdoses. Coroners generally labelled this as death by misadventure. A woman could have easily self administered a fatal dose from her cosmetics kit and, as long as no suicide note surfaced, no one would have known why she died and there would still be interment on holy ground. Then, with the Burial Act of 1823, even known suicides had the right to lie in consecrated ground as long as the body was interred between nine o’clock in the evening and midnight, and with no performance of rites. What wonderful information! So thankful for your hard work here! Great research! Thanks so much for sharing. I have been a living historian (now Colonial through 1950’s) for 17 years. Health issues have forced me to accept a “new normal” and curtail some of the more physical aspects of my beloved hobby. I’m currently working on a program on Colonial through Civil War cosmetics, embellishments, and personal hygiene. Your information is invaluable! As I learn more, I’ll be glad to share also. I love those necklaces that have the ladies from the 1800s on them in clay. I just love this article and found it extremely helpful! Thank you for the inspiring words about the history of makeup! Luv ya! Very interesting text, I love reading about make-up in Victorian era. Though I don’t see how they could ever drop lemon juice in their eyes, it sounds horrible. Very interesting kits. Your article is very well written, has a lot of useful information. I’m glad I found it. Thank you for the information! It also draws my attention to how many of the ideas about make-up in the period are around still today. The idea of a natural make-up or using make-up without looking as if you do. Also, the fact that the make-up routine is something that must be hidden or at least not observed by men still nowadays by some people. Very interesting! I am doing a research on the romantic era fashion for men and women and this helped a lot, thank you. I am writing a book set in alternate Victorian England and this was immensely helpful. Thank you so much! Very informative and easy to read. Keep up the great work! I love your work, thanks ! Thanks for the info, I just had a random curiosity to google this, and came across this article. Cheers! I love this website so much. I have a huge project for school and it helped SO much. Thank You, keep doing what you do. I appreciate it and I’m sure others do too. Perfect for my 1860’s research project. Thank you so much! Thanks so much for this. I’m working on a novel set in 1898 in the Klondike, and while I’m sure many women there would have focused more on practicality than on cosmetics, probably a great deal more of them would have depended upon their appearance in order to strike their own gold. I have always been interested in Victorian beauty, photography, celebrities. I googled and I found this site. Amazing! I have bookmarked you and I look forward to reading more. Thankyou ! This website really helped with my homework i was so happy i found this thanks so much.